Deb Lawrence brings us Dip the Hip: figure-8 movements to make room in the pelvis for baby to rotate from the right to the left, from posterior to anterior. She noticed a tight spot in the mother’s back was associated with a lack of rotation to the anterior and she developed this technique to loosen that spasm. It works. This can be done in pregnancy every day and in labor as needed; the earlier the better. Adrienne Caldwell, theraputic massage therapist and Spinning Babies advisor, recommends doing this gently. Women seem to get the same excellent results. Gentley may reduce a small risk of achey S. I. joints afterwards. Send us your story, your photo or link to your online video clip of doing the Hip Dip! Meanwhile, visit my blog to see Deb herself Dip the Hip. After a tremendously releasing session at Lake Pointe in St. Louis Park, MN (Minneapolis) with Dr. Carrie Getzmier, DC, I hurried to make another appointment with her. At that moment, Dr. Jessica Peterson, DC, also came up to their reception desk. Dr. Jessica and I were suddenly talking about Deb’s Dip the Hip. I was wondering if it released the pelvic floor like the Sidelying Release as both seem to help babies rotate with similar effectiveness (according to initial reports on Dip the Hip). Why Does Dip the Hip Work? Dr. Jessica suggests Dip the Hip releases the Quadratus Lumborum. The quadratus lumborum connects the lumbar spine (and 12th rib) to the iliac crest. With unilateral contraction (not the labor contraction, but a shortening of the muscle described here) Quadratus Lumborum will pull the pelvis into lateral flexion (one hip pulled towards body center), bilateral contraction will pull it into extension (hips out but also too much lordosis). Nicole Deelah’s story about this brave birthing woman makes me smile! She faced her resistance, both in doing an athletic move during labor and in her Quadratus Lumborum! How many times should I do Dip the Hip? Doing the Dip the Hip about 8 times through with a little centering in between each “cycle” of each hip helps keep the muscle attachments to the hips flexible in the back. Could Dip the Hip Turn an Anterior Baby to Posterior? I doubt Dip the Hip could turn an anterior baby to posterior. Moving the baby is not how Dip the Hip works. Dip the Hip is a “soft tissue” exercise for flexibility and “balance” in the pelvis and does not manipulate the baby. The baby simply finds new space available and gravity helps the baby seek the comfort of this new uterine space. 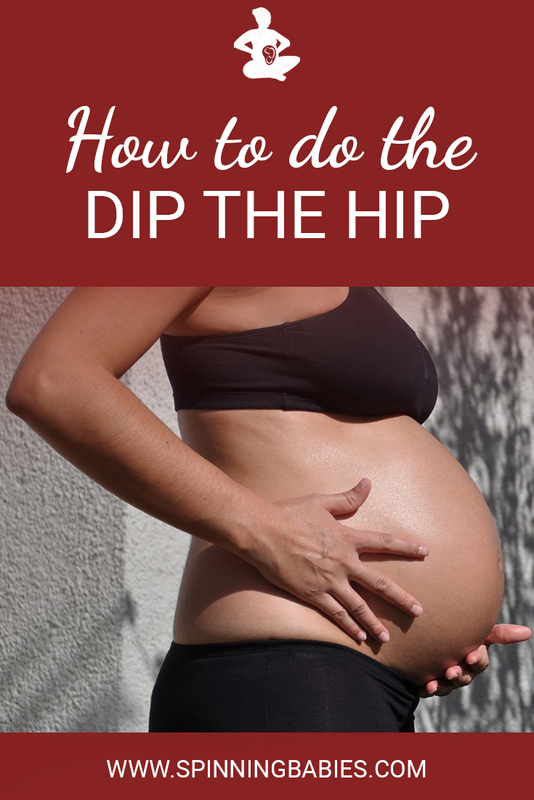 Should I do Dip the Hip in pregnancy every day? Doing Dip the Hip frequently in pregnancy should be ok, just don’t strain. Overdoing anything in a vigorous way is not the way to soften for birth. Also, mix up your activities to lengthen other muscles. Do daily activities, such as: Forward-Leaning Inversion, calf stretch (for two weeks before squatting) and also forward lunges. Hip openers and triangle pose (a yoga technique to stretch muscles down by the front of the pelvis and pelvic floor) are important. Do weekly activities, such as: the Sidelying release, Standing Sacral Release is a powerful but super gentle way to give flexibility to your sacrum, very necessary when the front of the pelvis has less room. What I call leg circles are nice for the front of the pelvis, too. I don’t have this technique online. Its a myofascial release of the leg sockets done by a helper while the receiver lies on their back. Might be worth a search on youtube or such to find examples. Please share the link in an email or by posting on my facebook page if you find a good example. Dip the Hip is an exciting addition to our collection of body balancing exercises. I thank Deb Lawrence for sharing this technique at a Chicago Spinning Babies Workshop hosted by mother Sarah Zematis.